Borys and dhijana Scott-Harmony are among Charlotte's best known “urban homesteaders.” The couple, who were profiled by the Observer in 2007, did away with the grass at their Starmount home near South Boulevard. In its place, they put in a series of agricultural projects, including vegetable gardens, greenhouses, a fish pond the size of a swimming pool and a chicken coop. The neighbors continue to be unhappy about it, however. Following are excerpts of an interview with dhijana (who lower-cases her name) by reporter Mark Price. Q. How are things with that one neighbor who hates chickens? We went to mediation in early spring and negotiated a solution. He wanted a visual barrier, and we ended up with a compromise. He didn't like to look out the window and see the “mess” we have and hear the sound of the chickens. Now, he gets to look out the window and see an 8-foot-tall wooden fence. … I'm impressed with the animal control supervisor, who got involved and suggested we go to mediation. We have eight of our original flock (of 20) left. … Borys' pet chicken, Rosita, died, but we'll have a new Rosita. A Three-toed Sloth for sale in the Belen market (photo by Sally Kneidel). The woman behind the table looked decidedly displeased, so displeased that I felt a little frightened. But what could she do? Probably nothing, so I took the photos of the sloth for sale anyway. I knew I was being rude - she was probably just trying to support her family, or maybe the sloth wasn't even hers. But how could I not take pictures? Especially when a local policeman was playing with the sloth, shaking hands with it, unconcerned about the legality of a sale. After a minute or two, my Peruvian friend Cesar told me "enough" with the photos, and I stopped. We were in his hometown of Iquitos, Peru, and naturally, he didn't want to antagonize the locals. So we moseyed on. We were tooling around the Belen outdoor market, a huge daily gathering of individual vendors, on the bank of the Amazon River in Iquitos, Peru. 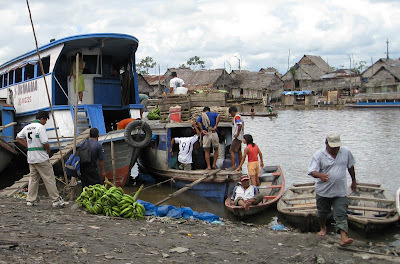 Belen is a low-income area at one end of Iquitos. The informal market begins at the waterfront in Belen and spreads uphill. Vendors at the market sell items brought in from villages along the Amazon: crafts, bushmeat, rainforest fruits, nuts, vegetables, animal and plant parts used as traditional medicines....and lots of wildlife. Some of the sellers are villagers, others are middlemen. 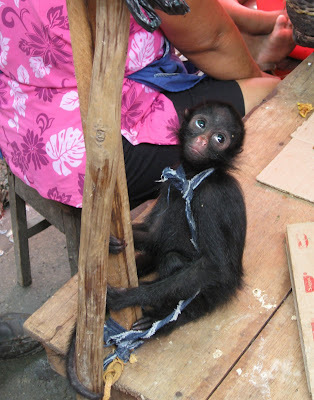 A young Spider Monkey in the Belen market (photo by Sally Kneidel). As Cesar and I moved away from the woman offering the sloth, we came immediately upon a woman selling a juvenile Spider Monkey that was tied to her small table with a strip of blue cloth. The seller sat behind the table in black shorts and a pink top, chatting with a barefooted teen on the floor, oblivious to my camera. I paused to take the little monkey's picture....then we spotted the tamarins and marmosets for sale farther down the aisle. Most of these tiny primates were immature and in cages, some were tethered to tops of cages. Others were perched on human shoulders, to show off their pet-appeal. 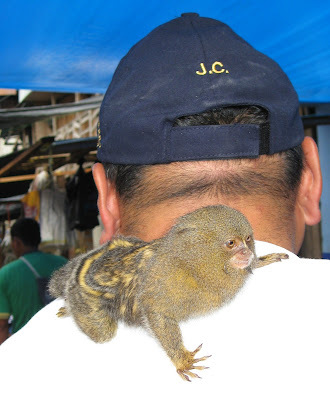 An adult Pygmy Marmoset, among the world's smallest primates, on display in Belen market (photo by Sally Kneidel). I was stunned at the price of the tamarins. These caged youngsters had probably been captured by shooting their mothers, the only way to bring a tamarin and her clinging infant out of the treetops. The young ones might survive a life as a solitary pet in an Amazonian village, but if smuggled abroad, their chances for survival were low. Seeing the young tamarins grimacing in the cages - that's when I really understood the meaning of wildlife as a commercial commodity. I asked the proprietor of the first tamarin cage, a teenage girl, to please put a water dish in the cage. She seemed puzzled about why that would matter, but did as I asked. Primates may have been the most common living animal in the market...but the parrots for sale were close behind. Some were adult parrots, perched atop cages. Others were hatchlings laid together in little baskets lined with cloth, so young that they had only their "pin feathers" - the beginning sprouts of feathers that look like little spikes. The nestlings were too young to sit up straight, but were slumped on the floor of the basket or leaning against the side for support. 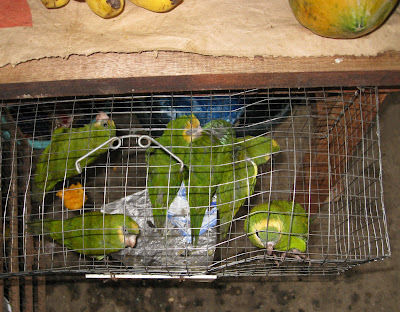 Parrot nestlings for sale at Belen market (photo by Sally Kneidel). In pic above, Amazonian parakeets and/or parrotlets for sale at the Belen market (photo by Sally Kneidel). 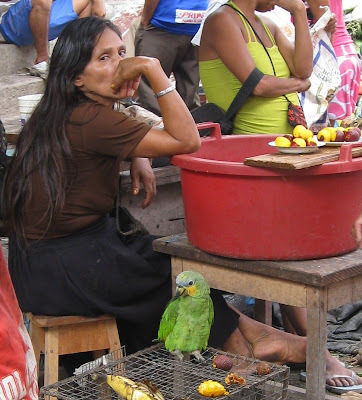 In above pic, adult Orange-winged Amazon Parrot (Amazon amazonica) for sale, Belen market (photo by Sally Kneidel). The Belen market is disturbing, but it's also fascinating - for what it represents about the conflict between the needs of expanding human populations and the long-term prospects for wildlife populations. 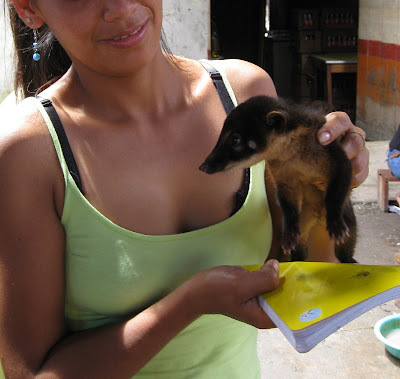 In Belen, wildlife is a forest product that can bring in a few soles; it's a resource the people along the Amazon have always had. Families from remote villages teetering on the brink of subsistence bring to the market whatever they can sell or trade. Can I blame them? If my kids had no medical care or clean water or functional school, would I not sell what I could to provide for them? The plight of Amazonian wildlife is sad and even infuriating for me, given the mass extinctions that most scientists agree we're headed for. But the poverty that drives people to deplete their most valuable natural resources - the rainforest wildlife and trees - is equally distressing. Unloading items for the Belen market (photo by Sally Kneidel). Cesar and I walked out from under the tarps covering the market and down to the water's edge for a breeze, to escape the mosquitos and fishy stink of the market. Dozens of boats were pulled up to the muddy shore, their owners unloading bananas, dried fish, animal skins, parrots, etc. Families may travel by boat for days to bring their offerings to the Belen market. Those who had finished unloading paused for lunch, sitting on crates, a plate with a banana and a roasted piranha balanced on one knee. An intact armadillo was roasting over a fire smoldering in a rusty steel drum. 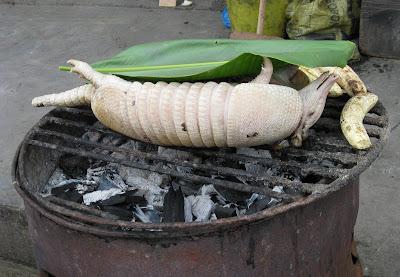 Lunch roasting: armadillo and bananas (photo by Sally Kneidel). 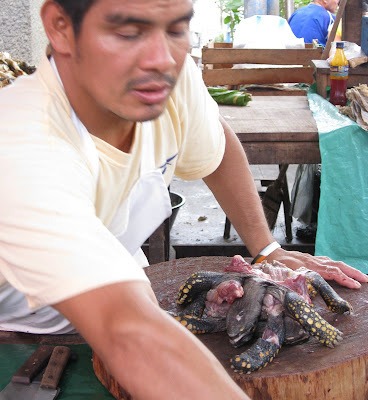 I'm guessing that most of the bushmeat in the Belen market is consumed by local people - the turtle eggs and turtle meat, the armadillos, the dried agoutis, the peccaries, the dried and fresh fish. Most of what we saw was too perishable to travel far. There was no ice in sight. 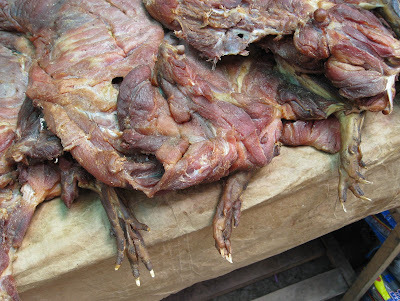 Dried agoutis for sale in Belen, above (photo Sally Kneidel). 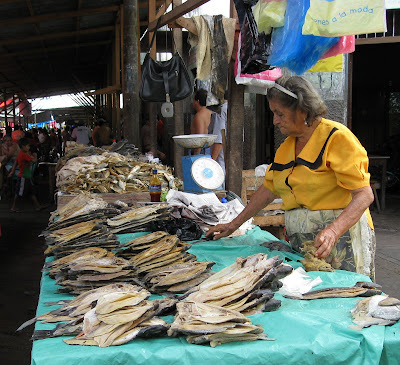 Dried fish for sale in the Belen market (photo by Sally Kneidel). Local people are probably the main consumers of the animal parts sold as medicine, too, in the Belen market. Probably people all up and down the river from Iquitos shop there for traditional remedies. These medicinal animal parts - bones, skin, eyes, penises, organs - are sold mostly in the form of powders or liquids. Some items are dried and intact. In the Belen market, the medicine booths occupied a whole long aisle, and the aisle was jammed with local customers. Each booth offered hundreds of bottles and baggies of once-living material. Many of the medicinal plants they offered, ground and dried, do have healing value - many modern medicines prescribed by MDs were originally derived from tropical plants. But animal parts are a different matter. Most of the animal parts offered at these booths have traditionally been thought to offer the customer the perceived qualities of the animal being consumed. For example, eating owl eyes might be thought to improve failing vision. 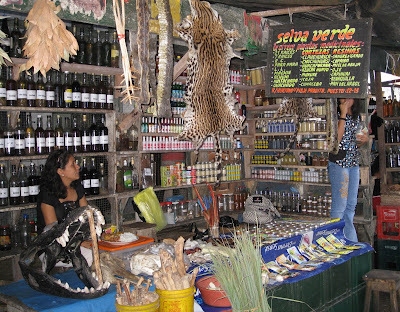 Above: One of many traditional-medicine booths in Belen market, selling animal and plant parts used traditionally as medicine (photo by Sally Kneidel). Many of the bottled items at the booths in Belen had flashy labels that offered enhanced virility or sexual performance. Aside from the bottles and baggies, the traditional-medicine booths offered whole anaconda skins, jaguar skins, raptor feathers, viper heads, and dolphin jaws for sale, too. Maybe these whole items are thought to bestow some sort of status or power on the owner - I don't know. Or perhaps these are the wares that make their way to someone's den in the United States. 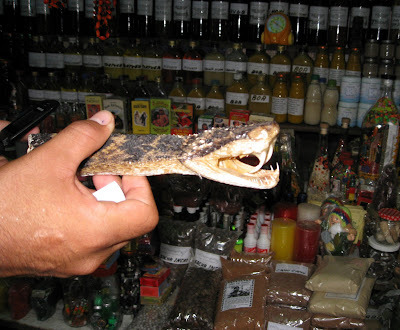 A viper head for sale in a traditional-medicine booth in Belen market (photo by Sally Kneidel). So the meats, eggs, and the "medicinal" animal parts probably stay pretty local. But what about the living animals? What about the parrots, the primates, the baby coatis, the anteaters, the sloths we saw for sale? Where are they headed? Thousands of animals every year are smuggled into the United States from Latin America for the pet trade. They are brought into the U.S. the same way drugs are carried in - in suitcases, in the trunks of cars, packed into crates disguised as something else. I don't know how many come from Iquitos, or Manaus, a Brazilian city on the Amazon. I do know that once the animals are in the United States, selling them is easy. I picked up a few copies of "Animal Finders Guide" while researching our book Going Green. Animal Finders Guide is a weekly newsprint magazine that advertises wildlife for sale in the United States. Its pages offer coatis, marmosets, tamarins, capuchins, baby spider monkeys, parrots.....even camels, zebras, and chimpanzees! These are not "zoo to zoo" sales, but individuals selling to roadside menageries, pet owners, research labs, or shooting farms (where trophy hunters pay a fee to shoot exotic wildlife). I called a guy in Texas who had placed an ad in AFG selling chimpanzees from his home. He said if I wanted to buy one of his chimps, he would drive to meet me halfway. No paperwork needed, he said. Each issue of Animal Finders Guide carries ads not only for individual animals, but for wildlife auctions across the Midwest, such as the infamous "Woods and Waters." 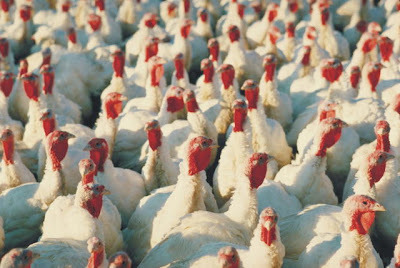 Autumn is a peak time for unloading animals at auctions, because their upkeep is more expensive in winter. There is so much we can do, it's hard to know where to start. The biggest threat to world wildlife is loss of habitat, and climate change will become the biggest driver of habitat loss in the years ahead. Curb your own emissions. Take our carbon-emissions test and get a grip on your contribution to that problem. Eat less meat and fewer animal products. According to the United Nations, the "livestock sector" creates more greenhouse gases than the transportation sector. Support nonprofits that are working to help people in developing nations pursue sustainable livelihoods, livelihoods that don't involve the overharvesting of forest "products" such as trees and wildlife. Ecotourism can provide sustainable livelhoods. When ecotourists (Americans, Europeans, Japanese, etc.) choose locally-owned lodging, and and hire local people as boatmen, drivers, and forest guides or birding guides, local communities have more incentive to preserve and protect their forests and wildlife. When you travel, try to direct your money into the pockets of local owners, rather than international chains. Supporting organizations that educate women and offer microloans to working women not only improves the quality of life for families and communities, it also supports conservation goals. When women have opportunites, birthrates decline, meaning less drain on limited natural resources. Consider making donations to organizations like H3O that make microloans to impoverished women to help them start home-based employment, such as making and selling crafts or sewing or opening small shops. If you want a pet, get a cat or dog, ideally from your local Humane Society. Don't buy a bird, any bird, whether bred in captivity or wildcaught. 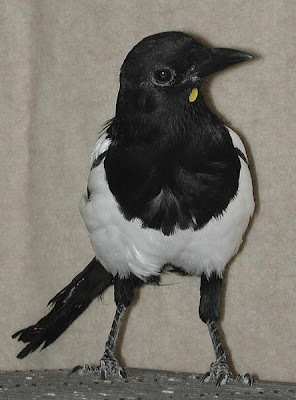 Even buying birds bred in captivity encourages the popularity of birds as pets. If you must have a bird or reptile, get one from a bird or reptile sanctuary that takes in abandoned pets (locate by googling). Don't buy primates! They don't make good pets. If you love monkeys, donate to an organization that supports conservation of their native habitat. 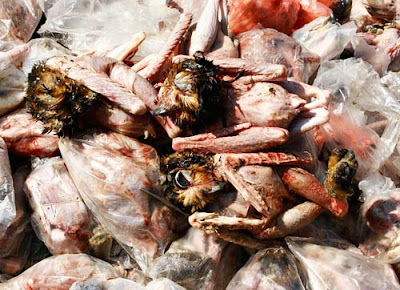 Consider contributing to nonprofits such as TRAFFIC, World Parrot Trust, and Defenders of Wildlife that are working hard to slow the illegal trade in wildlife and wildlife parts - the 3rd biggest blackmarket trade in the world, after drugs and weapons. We're not powerless. Americans have more power for change, with our charitable contributions, our travel selections, our consumer spending, than any other group in the world. Exercise your power, and choose selectively. If you need some gut-level motivation, take a trip to the Amazon, and stroll through the market in Belen. You'll find the live-animal aisles on the lowest tier, with the mud and mosquitos. Robert Kennedy Jr. to lead the EPA for Obama? Obama may be considering Robert Kennedy as head of the EPA, according to internet buzz. What fantastic news! I wrote an article earlier this year describing RFK Jr as the most influential environmentalist of our time. And that's a heavy statement, given what Al Gore has accomplished. No point in comparing the two, but I do believe that RFK is ideally suited to take the reigns of the EPA. Bobby Kennedy is an environmental attorney; he also heads up Pace Law School's litigation clinic. As such, he teaches environmental law and oversees numerous lawsuits filed against corporations that are violating environment laws in order to save money for their stockholders. Cleaning up effluent before it ruins rivers, scrubbing smokestack emissions - these are expensive processes that no corporation will take on unless forced to do so. RFK's lawsuits force them to. Robert Kennedy really gets it. He understands that corporations will press as far as they are allowed to press in order to maximize their profits, because, as he said, "their only obligation is to their shareholders." They will take the low road, the polluting road, whenever possible. If you doubt this underlying principle of the corporate world, watch the documentary The Corporation. It will make a believer of you. Kennedy is also the president of the Waterkeeper Alliance and has been for some time. 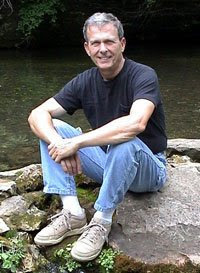 He's passionate about clean rivers, clean estuaries, clean streams and lakes. When I asked him to endorse our 2005 book about factory farms in North Carolina, he agreed to do so because factory farms are among his "pet peeves" - according to one of his staffers. Kennedy knows that factory farms and the giant meatpacking corporations behind them have trashed the NC coastal plain, have been allowed to by lax enforcement of environmental laws. He feels so strongly about the environmental damage done by factory farms that he traveled to Poland with Animal Welfare Institute's Diane Halverson in an attempt to stop the takeover of Polish hog farms by the polluting American meatpacker, Smithfield. You can read about that venture on AWI's website. Kennedy knows how corporations get around regulations. From years of litigation, he knows all their tactics and strategies. He will nail them. If he doesn't have his hands tied by lobbyists, he will nail the perpetrators - the corporations that foul our water, exploit our land, and cloud our skies - he will nail them to the wall. I feel giddy thinking about it. But that's not the only reason Obama likes him. Obama himself has a quality that can move people, can make grown men cry. Tuesday night, when Obama made his acceptance speech, my husband cried and cried and cried. I don't mean his eyes got moist. He really wept. It may have been the second time in a couple of decades that I've seen him cry. Tonight at dinner, he tried to explain it to me. He said it was like he'd forgotten how to feel patriotic, it had been so long. He had forgotten what it feels like to have hope for his country, and for the planet. He said that during his acceptance speech Obama went through history pointing out all the things our country has overcome, saying "Yes we can." And Ken felt it somehow. Felt maybe we can. Felt patriotism stirring. Ken the cynic. He felt it and it made him cry. I felt a lot of the same feelings when I heard RFK speak a few months ago in Charlotte. He began with material I sort of knew - he talked about what he does in his job, the lawsuits, and the companies that will get away with whatever the government allows them to do. Kennedy said polluters create wealth by making others poor, by depleting and destroying resources for others. The "revolving door of plunder," he called it. He surprised me by saying that he is not an environmentalist but a "free marketeer." He calls himself that because he believes that corporations should be made to internalize all the costs of their production methods, including the costs to public health and to the environment. If their effluent causes liver cancer, or their emissions cause asthma, or their production methods blow mountaintops off, then they should pay the costs to the local communities, in lost wages, or medical costs or whatever. Can you imagine if Kennedy were able to pull that off, as head of the EPA? But this is what brought me to tears. He talked about camping with his sons, how he loves the mountains, the trees, and the rivers near his home. He said "wilderness is the undiluted work of the creator. Wildlife is the way God communicates with us most forcefully, with force, with clarity, with texture." Americans love and value nature, now and since our inception as a nation, he said. Consider Thoreau, Emerson, Merwin. In fact, he said, "nature is the unifying theme of American culture." Robert Kennedy made me love my country. He made me want to fight to keep it clean, and he made me angry in a new way at the values of corporate profit in Bush's administration, the values that have cheapened the natural resources we have been blessed with. See how he fits with Obama? They are, quite simply, two of the most inspirational living men I know. They both have the gift of describing the big picture, the global picture, the historical picture in a way that makes us want to get to work to save it. Please, please, please pick RFK to head up the EPA. Keywords:: RFK Robert Kennedy Jr. EPA Obama Bobby Kennedy Jr.
Environmental education: A new necessity for healthy kids? As a new generation of American children face more adult stresses than ever before – pressure to achieve adequate test scores, rising rates of childhood obesity and its accompanying diabetes, asthma, hypertension, and emotional complications - scientists have found an unexpectedly simple cure. The American Journal of Preventative Medicine reports this month that the silver bullet for children’s physical and emotional health is no medicine at all: rather, it’s access to natural green space. In a recent study of 3800 children ages 3 to 18, mostly poor and African-American, scientists documented a dramatic health disparity in children living in urban neighborhoods with varying amounts of green space. Children with access to more wild areas – from vacant lots to city parks - gained weight more slowly than their less green counterparts, and were less likely to be obese as adults. They also displayed higher cognitive functioning and fewer symptoms of ADHD. Adult residents of greener neighborhoods, meanwhile, tend to display lower stress, lower weight, and better health. These results come as no surprise to some policy makers. In an attempt to patch over educational gaps left by No Child Left Behind, the groundbreaking No Child Left Inside Act passed the House in September. No Child Left Behind demands that children meet grade level standards in reading, math, and science. In a push to prepare students adequately on these subjects, this legislation has sidelined topics deemed more superfluous, including environmental education. It’s not surprising, then, that in a recent study, two thirds of American adults failed a basic environmental quiz and 88% failed a basic energy quiz. “Forty-five million Americans think the ocean is a source of fresh water and 130 million believe that hydropower is America's top energy source,” the study findings report. No Child Left Inside would provide $500 million over the next five years to fund environmental education in K-12 classrooms. As the environmental education movement gathers steam, more and more educators acknowledge the necessity of training the newest generations to be wise stewards of our dwindling natural resources. As today’s children reach adulthood, they will have to make unprecedented decisions about our energy resources and the health of an overtaxed planet. Biologists use the term mutualism to describe a relationship between two species that benefits both parties. 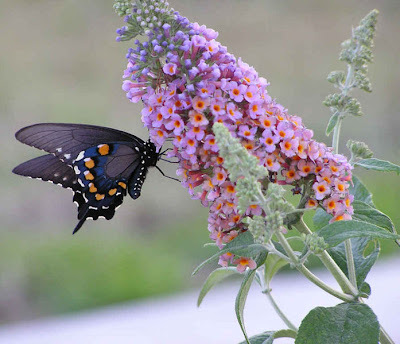 For example, a hummingbird drinking nectar from a flower both feeds itself and pollinates the plant. Perhaps humans and the earth are mutualistic as well. By preserving the health of our green spaces , we are also protecting the health of our children.